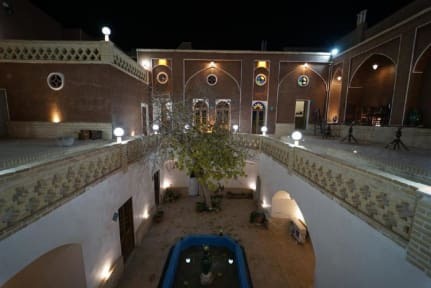 Sana Historical Hostel i Kashan, Iran: Bestill nå! You're able to cancel your booking 24 hours before you arrive. 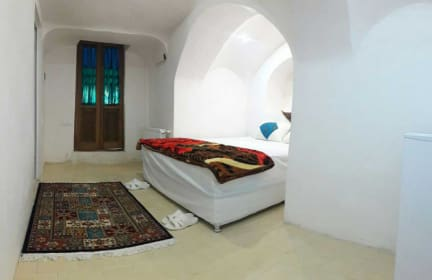 Sana Historical Hostel (SHH) is located in the center of Kashan old town. The beautifully restored historical building has a classic central courtyard garden with a basin, cooling the atmosphere in Kashan hot climate. It is used as a community area, like most historical houses. Facilities and services include Twelve rooms, a TV, a minibar and an air conditioning in each room. Private bathrooms in eight rooms, and a sharing one for the other three rooms. Free WiFi in all rooms.Buffet Breakfast is included in the price,we have free services including: Bus ticket, Train ticket, Air plane ticket, Kashan map. We also sell iranian sim-cart in our hostel. Most of Kashan’s major sights are within walking distance of the hostel, including the beautiful Aqa Bozorg mosque, historical houses and big bazar. The manager offers tour to the desert and salt lake with 4×4 car(jeap) and Abyaneh village with a good car. We also have transfer from imam khomeini airport to kashan that the price is 15 euro for whole car.